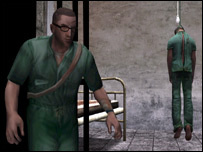 The developer of Manhunt 2 has won its appeal to force the British Board of Film Classification to look again at its ban on the game's release. The game has twice been rejected by the BBFC for certification, effectively banning the game for sale in the UK. Developers Rockstar contested the ban at the Video Appeals Committee, which ruled in the firm's favour. The game could now go on sale, if the BBFC, which is "considering the judgement", takes no further action. In a statement, Rockstar said: "We are committed to making great interactive entertainment, while also marketing our products responsibly and supporting an effective rating system. "We are pleased that the decision of the VAC has recognised that Manhunt 2 is well within the bounds established by other 18+ rated entertainment." David Cooke, director of the BBFC, said the body "exercised great vigilance and care in ensuring that all violent games which are submitted to us are correctly classified". He said the body had twice rejected the game "for its focus on varied and cumulative killings". He added: "We recognse that rejection is a very serious step, in which the desire of publishers to market their games, and that of gamers to buy them, must be balanced against the public interest." He said the judgement had to include the "full range of possible harm risks to vulnerable individuals and to any children who may be wrongly exposed to such games." "Such balancing judgements are inevitably complex and multi-faceted, and are made only after very careful consideration of the contents of a work," he added. He said the BBFC had played Manhunt 2 for "well over 30 hours prior to our decision".